The work of the Belgian-Swedish filmmaker and fine artist Oona Libens can be situated somewhere between expanded cinema, performance, sound art and pre-cinema visual trickery. Libens’ combination of slide projections, film, shadow play and tape loops flows together to create a completely unique experience that defies all categorisation. Following ‘Nausea’ (2014), all about the sea, and Libens’ graduation piece ‘Celeste’ (2012), an exploration of the universe, ‘Pharmakon’ is the third part in a poetic-scientific series, this time focusing on the microcosmos of the human body. With ‘Pharmakon’ Libens looks at our penchant for entertainment and social media, which can be seen as both poisons and medicines. The New York composer and improviser Lea Bertucci deals in all things electro-acoustic and minimal, but primarily makes use of the space around her as an instrument. Feedback-laden alto sax and bass clarinet is her calling card, in combination with experimental visuals and collages of musique concrète and electronica. During her new show ‘Projection/Reflection’ a projector placed behind Bertucci throws a focused beam of light onto a reflective patch on the performer’s back. The resulting pattern of light is reflected onto the wall behind her. Oona Libens is a Belgian-Swedish artist. Her work revolves around media-archaeology and the history of the (moving) image. She creates a unique universe by engendering a dialogue between old and new media – from shadow theatre, as the most primitive form of moving image, to the magic lantern, to the computer or television screen, to today’s entertainment society and Google. With her performances, Libens attempts to expand our experience of the image and the screen, to create an analogue virtual reality and an entertainment machine that is slow, hesitant, wobbly and prone to error. Since graduating from KASK in Ghent in 2012, she has worked on a series of poetic-scientific shows with subjects including the universe, the sea, time and the human body. 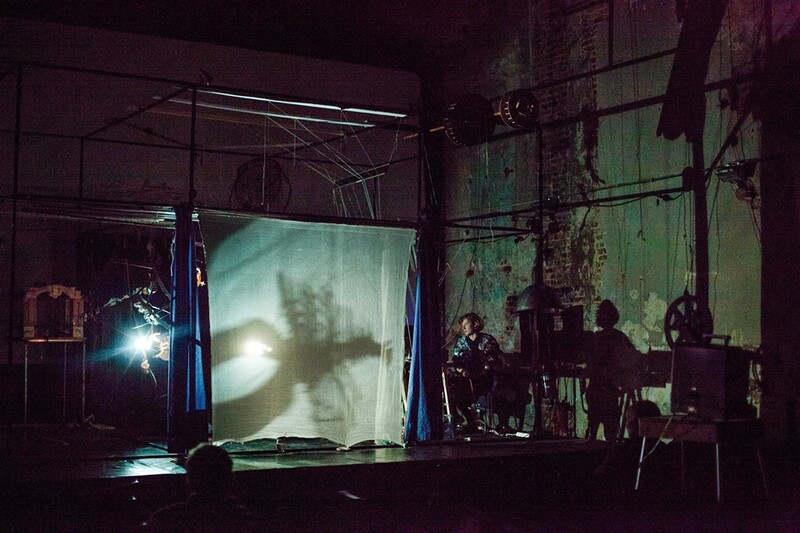 Lea Bertucci is multidisciplinary artist, composer and improviser from the US. In her work she describes the relationship between acoustic phenomena and biological resonances. In addition to her skill in alto sax and clarinet, Bertucci often makes use of multi-channel speakers, electro-acoustic feedback and experimental tape collages. In 2018 Bertucci released the acclaimed ‘Metal Aether’ with the renowned NNA tapes. “Noise that is untethered and limitless”, wrote Pitchfork. Last year she presented work at the MoMA, The Walker Museum, ESS Chicago, as well as at the Sound of Stockholm Festival and Le Guess Who in Utrecht. Tickets cost € 5 in presale and € 8 at the doors. Tickets and more information or go to the facebook event. Tags you may want to keep in mind: avant-garde and experimental. Organised by Kunstencentrum Vooruit, Film Fest Gent and Gouvernement, as the event is part of Film Fest Gent.